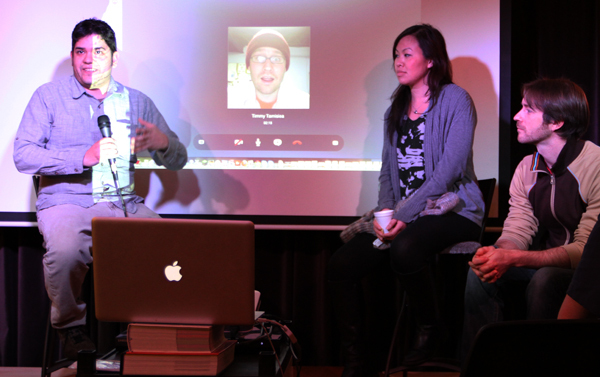 On the Mend Film Festival was a fusion between short, indie film and contemporary art at the Pig and Weasel in Evanston last weekend. The idea spawned from a conversation I had with P&W co-founder, Todd Rogers, at the rehearsal dinner for Dimitri Moore’s marriage to Naomi Hill. We were in the midst of the most expensive presidential campaign in history and shared the feeling that friendships, families and social constructs were coming apart at the seams. I told him about my film and he mentioned wanting to host a film festival at his venue. He and his wife, Monica Kass Rogers gave Diana and I free rein to curate a show around the theme of mending. Familia Bom Brill screened with Black ink on Rice Paper by Thavary Krouch and (Super)Dan by Tim Tamisiea. All three films dealt with wounded protagonists that each healed in their own way. The artwork came from Diana’s friends that use content, medium or process to reflect on the past, tear down old constructs and resolve conflicts. Under one roof in Chicago’s north suburbs, patrons found contemporary work from Chicago, Bloomington, DeKalb and West Chicago with films that represent/portray Hollywood, New York, Las Vegas, Cambodia, Colombia and Nebraska. It was an eclectic show but, more importantly, it brought together networks and ideas that move toward a common goal. Diana and I approached the curation differently but both with similar intentions. We both pulled from content that we’d watched develop over the years from artists that we stay connected to through personal connections… friends. One place where we differ is on whether to include our own work. As a filmmaker, I struggle to see film festival submission fees as anything more than a gamble at this point so if there’s a chance to put my film in front of an audience, I’ll take it. No shame in my game. Diana’s approach is more generous. If there’s empty wall space, she’d rather give her friends a chance to let their work speak for her. Either way, the important thing is to give a boost to artists around us because a rising tide lifts all ships. Friends Curating Friends, a recent article in New City Art puts our little shindig in a box of incestuous blemishes that are a sign of “a gallery scene in eternal puberty.” Pedro Vélez implies that small, alternative spaces are a burden because too many of his friends have shows on the same night and it’s painful for him to drive around the city to see them all. I see alternative spaces like Pig and Weasel as bubbles of activity in a kettle that’s about to boil, pulling networks together in the vacuum left by the last, popped bubble. As co-owners Todd and Monica Rogers say, it’s where ideas pop and dreams fly. It’s coincidental that one of the shows referenced in Pedro’s article is Plant Life at Western Exhibitions because the curator, Geoffrey Todd Smith, is a friend of Diana’s and plant growth is the focus of her next show; Rooted, Grounded. The show was curated by Angela Bryant for Design Cloud Art Gallery and it also features work by Benjamin Gardener, another friend of Diana’s. Maybe instead of a boiling kettle or pimply teenager, we can describe the art scene in Chicago as organic or grassroots. To tie this to the idea of mending, In Defense of Weeds has a list of beneficial weeds that can alert you to nutrient shortages in your soil. Are we witnessing Art Permaculture? 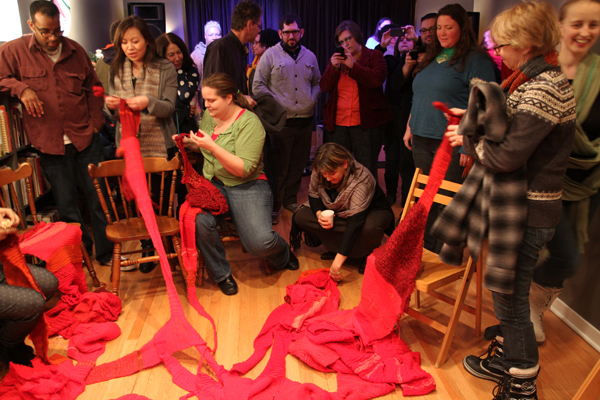 Lauren Turk’s artist statement says that mending isn’t always about bringing things together. Sometimes mending means filling the gaps. 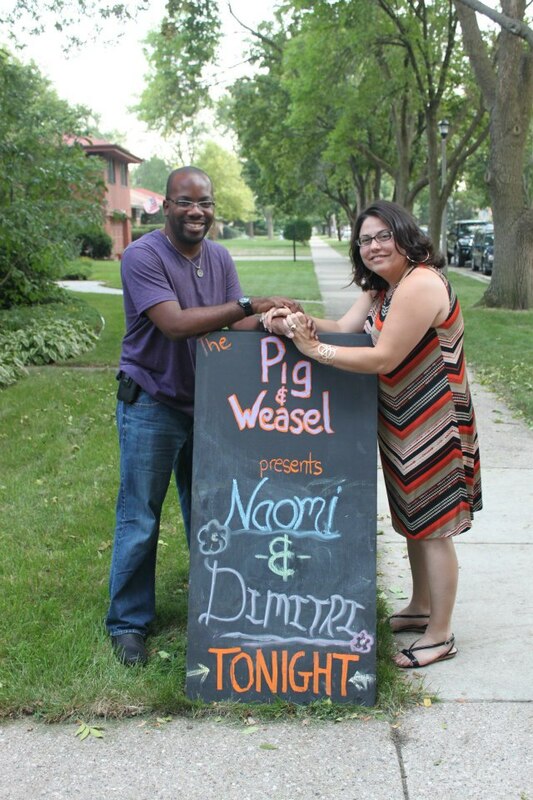 Maybe instead of asking audiences to make the “pilgrimage” to Chicago to see the galleries, we need to meet audiences halfway by bringing art to their neighborhoods like Pig and Weasel, People Made Visible and Best Friends Gallery… all friends of ours, btw. This entry was posted in Chicagoland, Creating, Cultivating Generosity, Events, Growing and tagged Abryant Gallery, angela bryant, anni holm, artist, arts, Benjamin Gardener, best friends gallery, Black Ink Rice Paper, Chicago, Chicago suburbs, Community, community building, Contemporary Art, Diana Gabriel, evanston, familia bom brill, Friends Curating Friends, Illinois, Jan Bryant, Juan Fernandez, Lauren Turk, Mario Contreras, melanie scott-dockery, monica kass rogers, on the mend, Paul Germanos, Pedro Velez, People Made Visible, pig and weasel, Super Dan, Thavary Krouch, tim tamisiea, todd rogers.